Kartchner Caverns State Park, opened in 1999, is one of Arizona’s newest wonders. 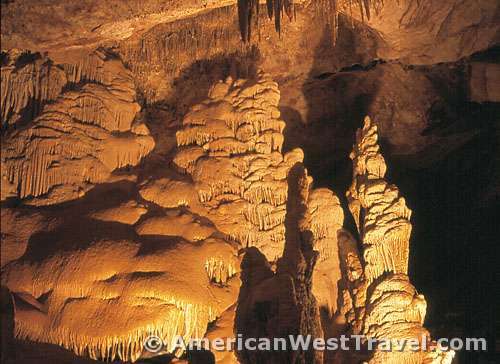 Kartchner Caverns is a stunning limestone cave system considered one of the top ten in the world. 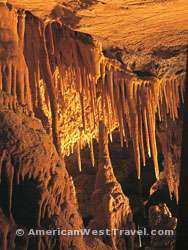 Discovered in 1974 by explorers Randy Tufts and Gary Tenen, and not revealed until 1988, the opportunity existed to preserve the caverns in near pristine condition. In 1988, the Kartchner family sold their land containing the caverns to the state of Arizona. The state has spent many years and much money to develop the caverns as a state park and attempt to preserve its pristine condition. Small groups have been taken on guided tours through the Rotunda and Throne rooms since 1999. In November 2003, the massive Big Room was opened to the public. Kartchner is a living limestone cave. An adequate supply of ground water percolates through the limestone, leaching out calcium carbonate. It is then re-deposited into all manner of exquisite formations. The calcium carbonate formations, which glisten with water, resemble marble. However the cave is extremely fragile. Exposure to outside air can dry out the cave and terminate its growth. Human handling can easily break delicate formations or ruin them with skin oils. Many well-known caves have suffered on both counts. 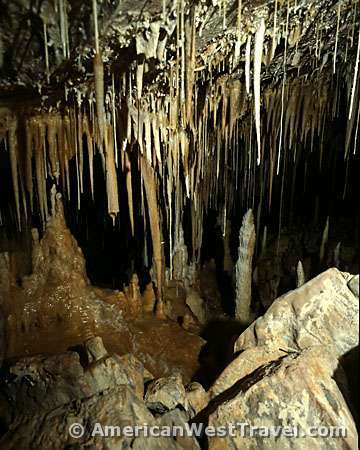 Kartchner Caverns has drawn international attention due to the state-of-the art techniques used to preserve and protect the cave and its sensitive ecosystem. On entering the cave, you pass through a series of hermetically sealed doors. Each rear door is closed before opening the forward door. The idea is to keep the dry desert air out of the humid (99%) cave. There are also misting systems within the cave. The trail is designed to keep human hands away from the more delicate formations. Gorgeous clusters of stalactites hang from the ceiling while large stalagmites rise from the ground. 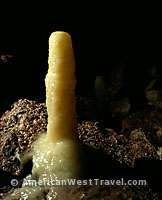 When a stalagmite meets the ceiling or a stalactite, the result is known as a column. (Note “c” for ceiling in stalaCtite. 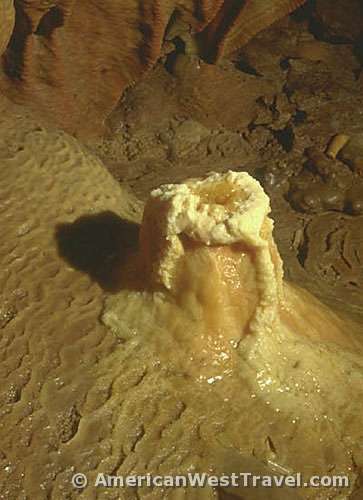 StalaGmites grow from the ground up – note “g” for ground.) Stalagmites are always larger than stalactites. 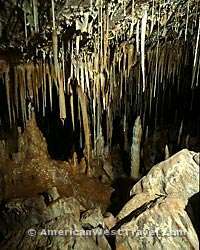 The force of gravity limits the buildup of the stalactites. The Rotunda and Throne Rooms feature spectacular soda straw formations. These are hollow calcium carbonate tubes that are formed when mineralized water drips through their centers. They grow at the rate of perhaps one inch per century. Their paper-thin walls can be broken with a touch. Kartchner’s Throne Room is home to the second longest soda straw in the world, measuring an unbelievable 21 feet, 2 inches! The room also features the massive column known as the Kubla Khan, standing over 58 feet tall! We recently toured the Big Room, the largest room in the caverns. At 400 feet long and 240 feet wide, it dwarfs Kartchner’s other rooms. Yet the trail has an intimate feel and offers many close-ups of nature’s artwork. For cave aficionados, the Big Room offers several rare or unique formations, including the first-ever discovery of “cave turnips”. These are actually speleotherms shaped like turnips hanging from the ceiling. Also found are excellent examples of flowstone, “moonmilk”, and exotic “fried egg” stalagmites (right). 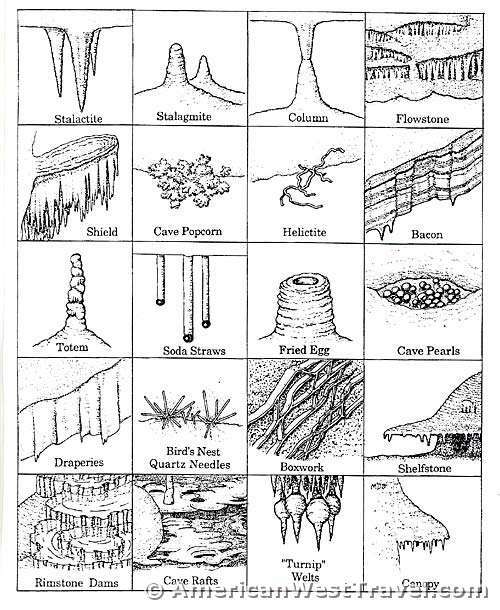 This diagram shows some of the formations found inside Kartchner Caverns. The Big Room is closed from mid-April through mid-October when the room is occupied by nursing bats. The guided tours last about an hour and a half. The park’s Discovery Center has excellent displays, a documentary film, and a gift shop. Photography is not permitted in the cave but many photos are available at the gift shop. If you decide to visit Kartchner Caverns, make tour reservations well in advance. Reservations can be made by calling (520) 586-CAVE (2283). 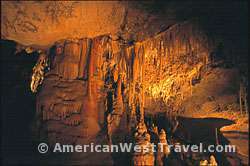 For more information, check out the Kartchner Caverns – Arizona State Parks web site. The caverns are located just south of Benson, Arizona, which is fifty miles southeast of Tucson on Interstate-10. Go nine miles south on state route 90 (exit 302 on I-10). There is an excellent campground with hookups within the state park.